Shohin bonsai is very poplar because of the easiness and cuteness. 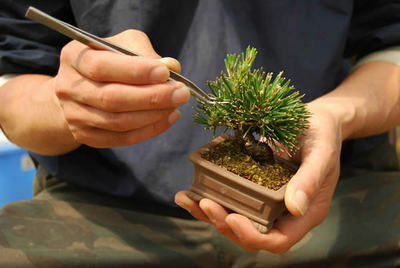 The height is under 20 centimeters, and it is also called "mini bonsai." Lord Yorinaga Matsudaira, the twelfth head of the Matsudaira Family who was ruling Takamatsu, started and named it. So artists in Kagawa want to inherit the tradition. Koji Hiramatsu is the 4th generation of Shunshoen bonsai garden in Takamatsu's Kokubunji town. He is one of the few young artists in Kokubunji. Others want him to be a leader for the future of bonsai. He has studied bonsai as the eldest son of Kuniaki Hiramatsu who has highly skill and saw the rise and follow with his own eyes. After visiting many exhibitions in Japan, he started to produce shohin for meeting his customer's earnest request. He says, "Shohin is suitable for the current graying society and housing condition. It is important for small sized tree to have the taste of large and old tree. 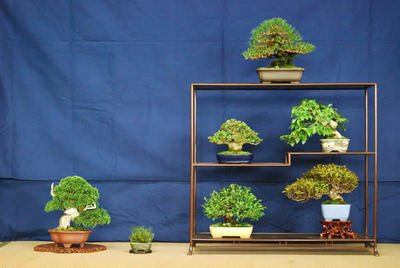 It is common for shohin to display 7 pots including grass bonsai in the shelf called "Fuji". In the harmony with the tree species, colors, and pots, it makes the great atomosphere. Depends on the combination, you can enjoy your own way to show. However some people enjoy a shohin alone. In Zoki, there are many species such as fruits, flowers, and grasses. In addition, each tree has a different way to take care. The size of tree and pot are smaller than other types of bonsai. So it is hard to water and wire, but it gets the taste by the best effort. In his lectures in various places, he tells the participants about the attraction of Shohin which is easy to cultivate and take care. He describes to them the beauty of the fresh green in spring, the brilliant color of fruit trees in autumn, and the sense of isolation of a trunk without leaves. With the expectation of popularity resurgence in bonsai, he says, "I think the population of bonsai will increase because of the retirement of baby boomers. I'm glad to see many women coming to my lecture."